AlertID announced today the launch of its Live Safely™ Resource Center, which allows members to obtain critical information about how to keep families and communities safe. AlertID announced today the launch of its Live Safely™ Resource Center, which allows members to obtain critical information about how to keep families and communities safe. The information comes from trusted sources and addresses issues that families face every day including bullying, cell phone safety, conflict resolution, cyber bullying, fire safety, fraud and identity theft, gang violence prevention, school safety and missing persons, among many others. The Resource Center provides detailed information and publications about each topic, program descriptions, and downloadable resources including coloring books, cartoons, and tips for children to learn how to protect themselves. The Resource Center’s founding partners are the Andre Agassi Foundation for Education and the National Crime Prevention Council (home of McGruff the Crime Dog®). The Agassi Foundation is dedicated to transforming public education through the Andre Agassi College Preparatory Academy, a K-12 tuition free public charter school in Las Vegas. The National Crime Prevention Council (NCPC) is the national leader in crime prevention. Its information, tips, and advice have helped families and schools keep children and communities safer for more than 30 years, which is why McGruff is recognized by more than 80 percent of children. NCPC works directly with thousands of law enforcement agencies across the country to help them address local crime and public safety concerns. To sign up for a free AlertID account, or for more information, please go to http://www.AlertID.com. About the Andre Agassi Foundation for Education. The Andre Agassi Foundation for Education seeks to transform public education in two ways. Through its signature project, the Andre Agassi College Preparatory Academy, the Foundation works to provide underserved children in Las Vegas with a first-class K-12 education to prepare them for excellence in college and beyond. Through state and national advocacy, the Foundation strives to increase investment in, and accountability for, public schools. To support the Andre Agassi Foundation for Education or to obtain additional information, please visit http://www.AgassiFoundation.org. The National Crime Prevention Council is the nonprofit leader in crime prevention. For 30 years, our symbol of safety, McGruff the Crime Dog®, has delivered easy-to-use crime prevention tips to millions of adults, teens, and children. Law enforcement agencies nationwide rely on our expertise to make an impact on personal safety and crime every day. For more information on how NCPC can be a public safety expert for you or how to “Take A Bite Out Of Crime®,” visit http://www.ncpc.org. 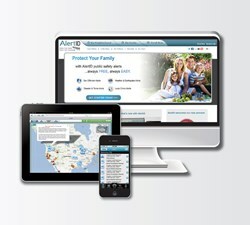 AlertID is the safe way to receive trusted public safety alerts and share information with neighbors at no cost to you. AlertID has proven to reduce crime and uses advanced technology to create a communication platform for citizens and federal, state, and local authorities to share information on crime, terrorism, or natural disasters that can threaten the safety of families and communities.